Fat is derived from both animal and plant based sources. Hydrogenated fats are created when hydrogen is added to vegetable oil to make it more solid. Trans fats are created via hydrogenation, and are very hard, which contributes to longer shelf life in baked goods. Fats can be in unsaturated or saturated form. Unsaturated fats, including mono-, poly-, and Omega-3, are usually in oil form and liquid at room temperature. They have a positive health correlation as they can reduce cholesterol levels. Saturated versions are solid at room temperature, originate mostly from animal sources, and can raise cholesterol levels. The crystalline structure of fat can be described by Alpha, Beta, and Beta prime. These are discrete individual crystals linked together in a multitude of ways, resulting in the different types of with specific characteristics. Alpha-crystals have the lowest melting points and loosest arrangement and are seldom encountered in solidified fats. Beta-crystal forms are high-melting, self-occluding, coarse, large, and exhibit the closest arrangement. Unhydrogenated beta-crystal, solid at room temperature and a high working temperature, is used in cakes, pastries, and cookies. Beta Prime-crystal forms are tiny, delicate, needle shaped, and capable of immobilizing a large amount of liquid oil. Shortening: Made from 100% vegetable fat, it is solid at room temperature. Obtained by the hydrogenation of vegetable oil, shortening gives pastries their flakiness, and gives cakes or cookies a lighter feel if creamed with sugar to trap air. Shortening provides breads with stability preventing airflow within the loaf during baking, and gives a desirable smooth mouthfeel and flavor. Butter: Consists of 80% fat and is made from cream. The remaining 20% is water combined with milk solids. Butter imparts flavor sans a greasy mouthfeel to all baked goods due to solubility at body temperature. Clarified Butter: Butter that has been heated to remove the sediment of milk solids therefore turning a clear color. 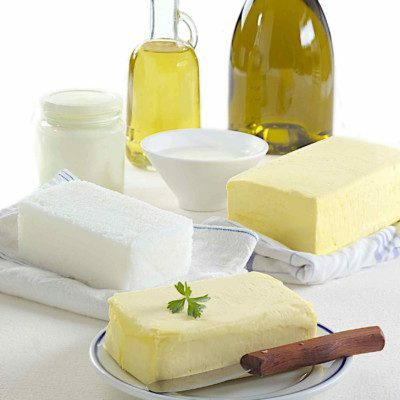 Margarine: Consists of 80% vegetable fat, and can be used interchangeably with butter. Oil: The original version of vegetable oil from soybean, canola or corn sources. It is used in some muffin, bread and cake recipes. Pastries utilizing oil rather than solid fat result in a mealy texture rather than flaky. In regard to cake recipes, interchanging oil for solid fat results in a heavier texture unless counteracted via increasing sugar or egg. To substitute oil for butter or margarine, use 7/8-cup oil for 1-cup butter or margarine. Ghee: Class of clarified butter with a subtle yellow color and rich nutty flavor, used as a substitute for pure butter in many cultures. Vegetable ghee, made from various vegetable oils, is more commonly used than ghee made via butter. Palm Oil: The main source of trans fat-free shortening; solid in nature at room temperature and made from palm oil. Cocoa Butter: Pale yellow, pure, edible vegetable fat extracted from cocoa beans. Used in chocolate chips. Olive oil: Fat obtained from grinding whole olives and extracting the juice. Used in focaccia bread and also in any baked good recipe. Can be substituted for vegetable oil. Lard: Pig fat has a very high smoke point, making lard ideal for culinary usage. In baking, lard is used in cookie production, pie crusts, and cakes. Fat inclusion is easily identified within a baked good, exhibiting a silky texture, or mouthfeel, and rich flavor. It provides an appealing visual aspect denoting a moist, creamy, fluffy, or shine element to products. It performs a multitude of chemical functions such as tenderizing, leavening, moisture retention, and texturizing. In muffins, pastries, and sweet dough, reducing the fat level results in a tougher product because gluten develops more freely. In bread making, a small amount of added fat (<3%) lubricates the dough and helps the gluten to stretch, yielding a loaf with greater volume in addition to contributing flavor. As fatexpert, I woud include the next paragraph. Transfats are not used so much anymore because they show a higher risk for increasing the bad cholesterol (LDL). Because of functionality of the harder fats in the baking process, alternatives have been developed; mainly blends with liquid oil and interesterified mixtures of fats. By interesterification the fatty acids are rearranged on the glycerol molecule and can deliver all kind of properties depending on the fatty acid compostion. I am not so happy with the last sentence about betha crystal fats. In most freshly processed fats no betha structure is present only betha prime! !